A range of properties might be produced in steels since the structure of different phases of microstructure depend on the cooling rate. Several aspects in this type of connection have previously been explained. In this section exact treatments will be outlined. Each heat treatment procedures comprise of three main steps. (a) The metal heating to predetermined heat treating temperature. (b) The soaking of the metal at such temperature till the structure becomes uniform throughout the section. (c) The cooling of the metal at several pre-determined rate as like well cause the formation of required structure. 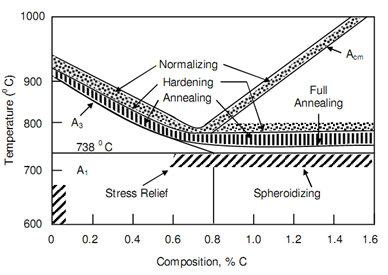 The heat treatments are generally applied to hypo-eutectoid carbon steels. These are as: hardening, normalizing and annealing. The temperature, to such heating is finish in all three cases is about 50oC above A3 temperature as denoted in given figure. The heat treatment of other steels will be discussed in exact section, here these steels are explained.